I think I might like to join but I just can’t decide! When you join our Guild you will receive a Welcome email containing your badges and membership certificate. These will include your unique Guild Registration number. This email will also contain your log in details for our website. (Please make sure that there are no spaces before or after your number as the system doesn’t like it. You can then enjoy your member benefits and create and edit your business directory listing. Please note that your business WILL NOT appear on our website until you have created this listing. Contact us and we will do what we can to help. We try to process memberships within 24 hours (week days) but this is not always possible. If you have sent in your application and three working days have passed please contact us. Emails do go astray and we WILL have sent you information. In certain instances our admin may be taking a well earned holiday and in these cases there will be a note on the application form pages stating when your membership will be processed. I have asked to join the Facebook Club but I haven’t been approved? We get a lot of applications from Facebook members who do not belong to the Guild. As this is exclusively for Guild members we can only approve people that we know are members. If we have not approved you this is probably because we do not recognise you from your Facebook profile, have you registered with us using a different name etc? On the anniversary of your subscription your membership will automatically renew through PayPal. You will get a notification after payment has been taken that says payment is To: Crystal Lady Designs, For: Professional Crafters Guild Membership, for the amount relevant for your level of membership. If you do not wish to continue your membership you have the right and can cancel your direct debit subscription at any time through your PayPal account, please remember cancellation must be processed at least 48 hours before the next payment is due, to give the PayPal system enough time to process your request. If you would prefer us to do this at our end please contact The Guild by email and allow The Guild 14 days to process your request with PayPal, so please allow enough time prior to your direct debit renewal for the Guild to process your request. If you cancel part way through your current year of membership, your entitlements and subscriber benefits will remain active until the date of renewal. You can request for The Guild to revoke all membership privileges before your membership expires, these include for example: your listings on our website and any access to the Guilds Social Media pages and members areas on the website. Product features through our social media and blog posts and articles will not be deleted. There are no refunds for unused parts of your annual membership, if you wish to leave with time remaining on your current year. However the Guild understands that life can throw up challenges beyond your control; please get in contact with the guild by email if you want to discuss this further. 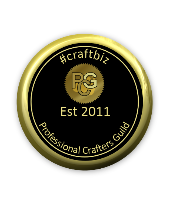 Members must always carry out their business in a legal and proper manner and realise that the Professional Crafters Guild will not intervene or mediate between your business and your customer. Members must notify us of any change to business details, email address, weblinks etc. It is the members responsibility to register for access to the members area once they have received their registration number. It is also the members responsibility to create and maintain their directory listing on the Guild website. Members must never intentionally or unintentionally hurt the reputation of the Professional Crafters Guild. Membership fees and benefits are subject to change without notice.